The world of The Tiger Lillies is dark, peculiar and varied, with moments of deep sadness, cruel black humour and immense beauty. This unique "anarchic Brechtian street opera trio" tours the world playing songs about “anything that doesn’t involve beautiful blonde girls and boys running at the meadow” to quote their founder Martyn Jacques. Hence, their songs cover all the dark aspects of life, from prostitution and drug addiction to violence and despair. Always with a touch of twisted humor and sharp irony The Tiger Lillies “point an implicit accusing finger back at us: what on Earth are we doing, laughing at this stuff?”. Their music is a mixture of pre-war Berlin cabaret, anarchic opera and gypsy music, echoing the voices of Bertolt Brecht and Jacques Brel. The Tiger Lillies shock, amuse and entertain in a postmodern vaudeville way, with their inimitable in-yer-face shows, where no limit should be taken for granted. "THE TIGER LILLIES concert in Bucharest" Concert in Bucharest. 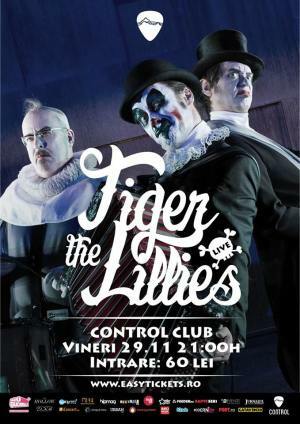 You can get here description, reviews, address, time and details of "THE TIGER LILLIES concert in Bucharest" Concert in Bucharest. Visit Bucharest Tips for more Concert events in Bucharest!